Elaine Hancock (Olney, United States) on 16 December 2011 in Miscellaneous. 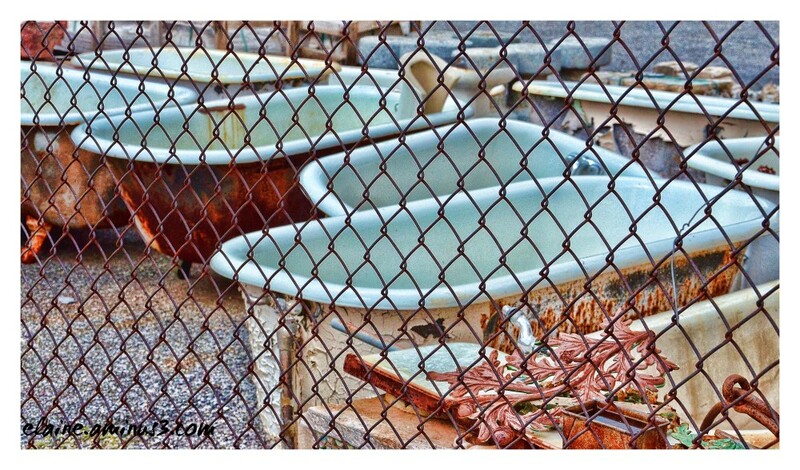 I saw these rusty bathtubs behind a fence. Not sure who would want them! Superbe ces vieilles baignoires rouillées et blanches au-travers du grillage, très original bien vu. I like the rusty bits here! Great color! What about a rusty bath collector ? I remember the times when these used to be smashed and sent for scrap, now once restored they are highly sought after. great frame . very interesting ! Excellent find Elaine - the fence makes for a much more interesting shot than if it were not there. Nicely done! Makes for a great photo opportunity though. Great shot! Well I do not, who's in it?? @Shar: The look like they might be comfortable. Nice and deep. I like the claw feet!